Click here for detailed picture tutorial. And here a with a bunch of other yarns…. 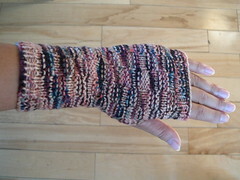 just make sure it is somewhere between sports, dk and light worsted. And make sure you have about 120 yards and you will be fine. Oh, lovely, thanks for sharing. Awww… thanks so much for letting me know, Ciorstaidh! 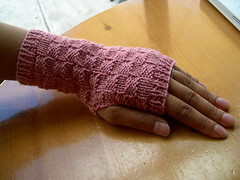 Hi, Saw your gloves at Close-Knit, in a lovely pink shiny yarn. I bought it and think it’s called Boulino. Do you remember which gloves they were? 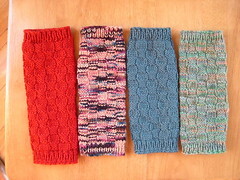 Now as I look at the patterns, they all seem to be knit-up in a much heavier weight yarn. 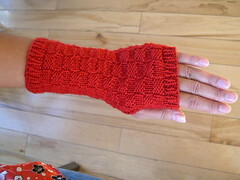 Saw your Seattle fingerless gloves in CloseKnit in January while shopping with my daughter. She was starting to teach me how to knit. 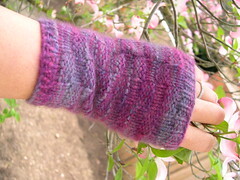 I loved the gloves, and she said I would certainly be able to knit them. 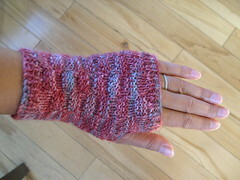 The first glove took a couple weeks to knit, but I was able to finish the second one in a week! I love them! 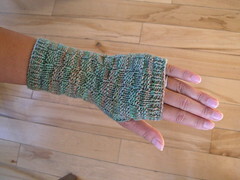 Thanks so much for sharing your patterns!